Here we are, wrapping another week of blogging in the company of Fibra Natura Radiant Cotton yarn. 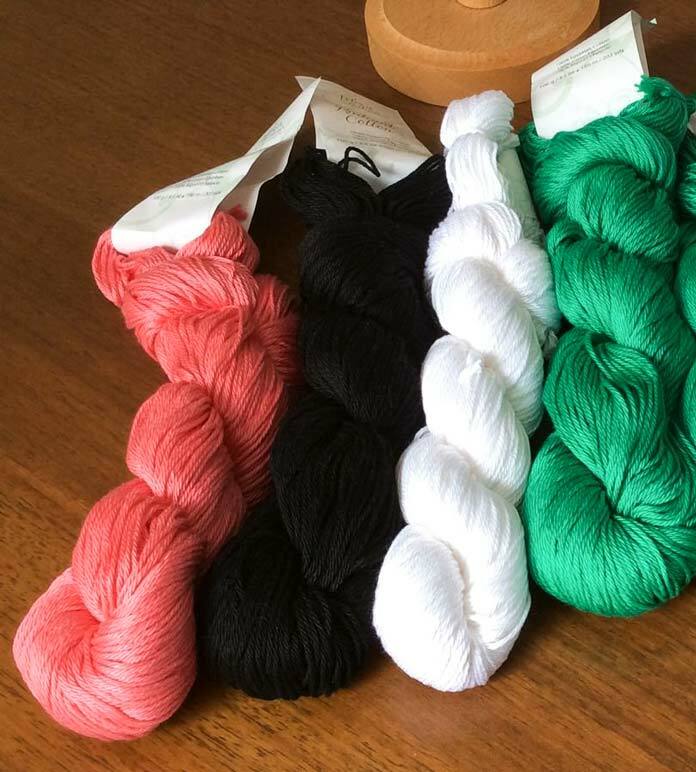 As I noted earlier in the week, Radiant Cotton has 24 bold and neutral colors to satisfy a knitter’s needs. Our Nippon China Dishcloth was worked with Calypso, a bright coral tone. 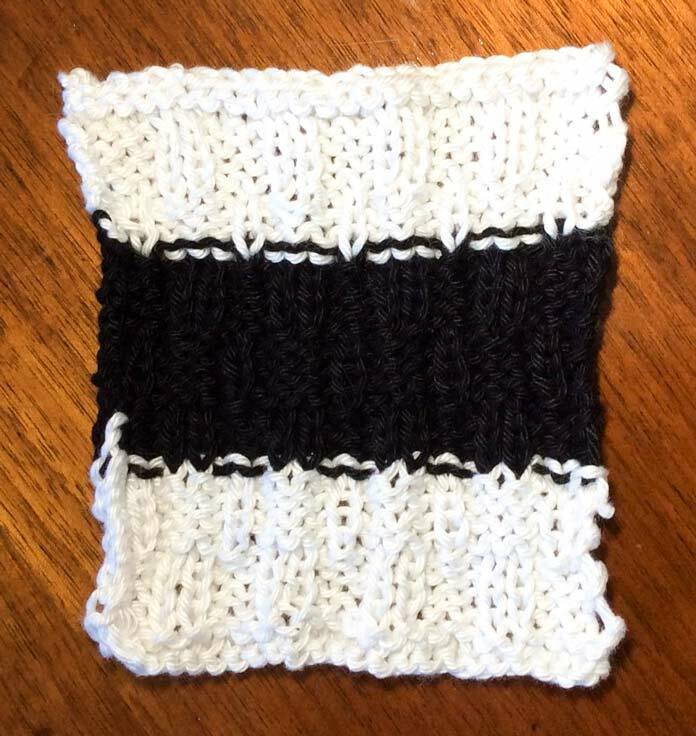 Today I’m knitting with neutral black and white, which, while neutral, still pack a punch! But what about the green, you ask? Look for it in an upcoming issue of A Needle Pulling Thread magazine. 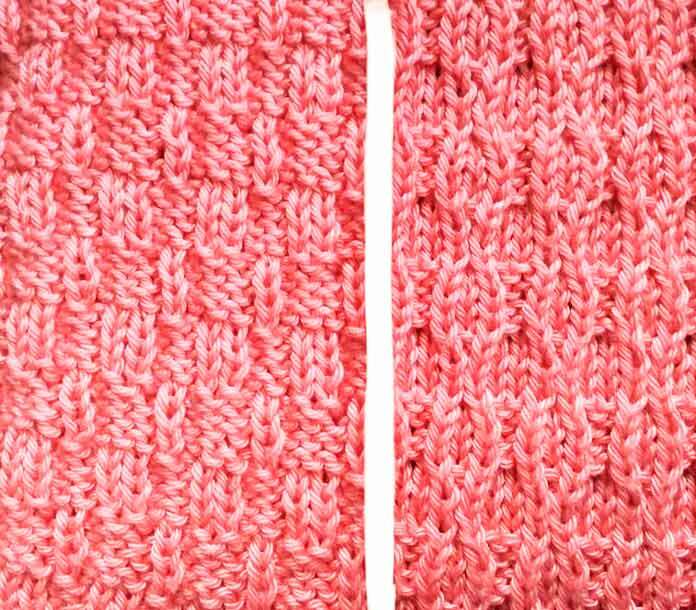 Today, I’ll show you how to add stripes without getting those “perforations” that usually happen with ribbing. I’ll be using the exact same stitch pattern I talked about yesterday, only wider and with some bold stripes. Our bonus lesson today is about negative ease. When we make clothes, we add something called ease. It’s extra fabric put into the pattern to allow us to move when we wear the garment. Some garments, such as socks and close-fitting summer tops, have negative ease to make the garment fit the body more tightly where we want it. Nobody wants a sloppy sock! Negative ease can also be used on fabrics where sagging could happen after repeated washing and wearing — this can be an issue for knits, and cotton knits in particular, as cotton has very little elasticity. It doesn’t matter if a face cloth or dish cloth stretches out with repeated washings and scrubbings, but I don’t want a pillow cover to stretch very far beyond its stuffing! Now, I’m fortunate in that I already have two knitted cloths from which I can gauge elements of my design, including how much negative ease I need in my pillow top. If you’ve been knitting along (which would be great), you can do this too. I took my 7″ wide cloth and found that it comfortably stretches to 9″ [23cm]. I’ll spare you the math here — if you want it, contact me through [email protected] with the subject “negative ease”. The upshot is that I want my finished pillow top to have 78% of the stitches I would use if I was allowing for no ease at all. Again, to make this simple, I want to make a 16″ [40cm] pillow cover. 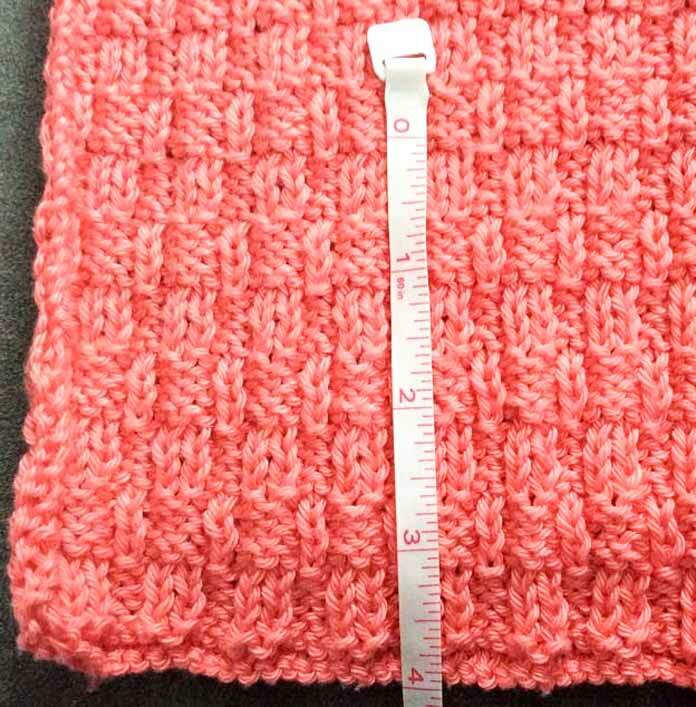 The gauge on my piece is 25.5 sts to 4″ [10cm] — a total of 102 stitches to get 16″. But, as my stretch test above tells me I only need 78% of those stitches, turns out I need 79.56 stitches — just a hair away from 80! PERFECT! Because I want to sew my pieces together, I can incorporate that extra fraction of an inch into the seam and still have my pattern work out! Remember this photo from earlier in the week? It shows how lovely the back of my Nippon China pattern is. I’m going to do one side of the pillow cover as we did for the sample on the left, and for the other side, I’m going to make it “wrong side out”! Because I have these great, bold colors, I want to add a great, bold stripe! Again, me being me, I want my stripe to be centered. You can choose to do it differently if you’d like. 78% of 16″ [40cm] is 12.48″ or roughly 12½”, and I want my pillow cover to be as close to square as possible, so I want my stripes fairly close to 4″ [10cm] each to break the pillow up into three thirds. Using my trusty dish cloth as a guide, I measured the “bottom third”, looking for a section that began and ended with the same 4-row block of pattern (either p3, k2 or p4, k1). I discovered that 3½ pattern repeats plus the 2 knit rows at the bottom measure just under 4″. The cast on, first two rows of knitting and 3 ½ pattern repeats is very, very close to 4″, which is quite close to 1/3 of the 12 ½” of my pillow cover. From this, I learn that my two white stripes will total just under 8″, so my black center stripe will need to be just over 4½” [11cm]. Conveniently, 4½ repeats of the pattern comes very close to this measurement! Now that I know I need 80 stitches, and 3½ pattern repeats before the color change. I can cast on from yesterday’s pattern and knit that far using yesterday’s pattern. The last row worked will be a Row 4 and the right side should be facing for the next row. If I just join in the black and knit the next row of the pattern, I’ll get this “choppy” result. Read on for my “secret” to avoid this. My “secret” for a smooth color transition between stripes is this: with the right side of the work facing, pick up the new color and replace the next (right side) row of the pattern with a plain knit row (in our piece, this is pattern row 5). After that, continue with the next (wrong-side) row of the pattern (row 6). You will lose a tiny bit of symmetry in the pattern, as this section of the work will only have 3 rows of “v”s in its knit stitches, but I’d rather have that then a choppy row of color across my work like the one in the photo above. Continue in black for the remaining half of the pattern repeat, and 4 more full repeats (end with Row 8 and RS facing for next row). Break yarn and re-join the original color. Knit across row 1, ignoring the knits and purls as above. Resume the pattern with row 2, and complete 3 full repeats, then repeat rows 1-4. Knit 3 rows, and cast off knitwise from the wrong side of the work. Break yarn, but do not weave in ends. For the other cover, I want to make another piece “inside out” of the one I just cast off. It will look like the piece on the right in the third photo above. You wait in the car, I’ll get this! Changing the chart is easy — with the exception of the selvedge stitches, all I have to do is make all the knits purls and all the purls knits! The top chart is the one from yesterday, which creates a predominantly purl-faced fabric. The chart at the bottom will make a fabric like the smooth version on the right of the split photo above. Remember the key to the chart: blank squares are knit on RS, purl on WS, and the squares filled in with a dash (-) are purled on the RS and knitted on the WS. Each dash resembles the purl “bump” on the right side of the fabric. The more challenging adaptation is to change the text. I’ve written these instructions as a “stand alone” pattern, not like the adapted instructions I gave based on yesterday’s pattern instructions. Because I’m flipping the pattern, I’ll flip the name – this is the China Nippon Pillowcover! Gauge isn’t imperative for this project, but aim for a gauge of 25.5 sts to 4″ [10cm]. With Col A, cast on 80 sts. K 2 rows. Work the lower chart above, or the following text. Rows 1 & 3: K1, *k3, p2; rep from * to last 4 sts, k4. Rows 2 & 4: K1, p3, *k2, p3; rep from * to last st, k1. Rows 5 & 7: K1, *k1, p1, k3; rep from * to last 4 sts, k1, p1, k2. Rows 6 & 8: (K1, p1) twice, *p3, k1, p1; rep from * to last st, k1. 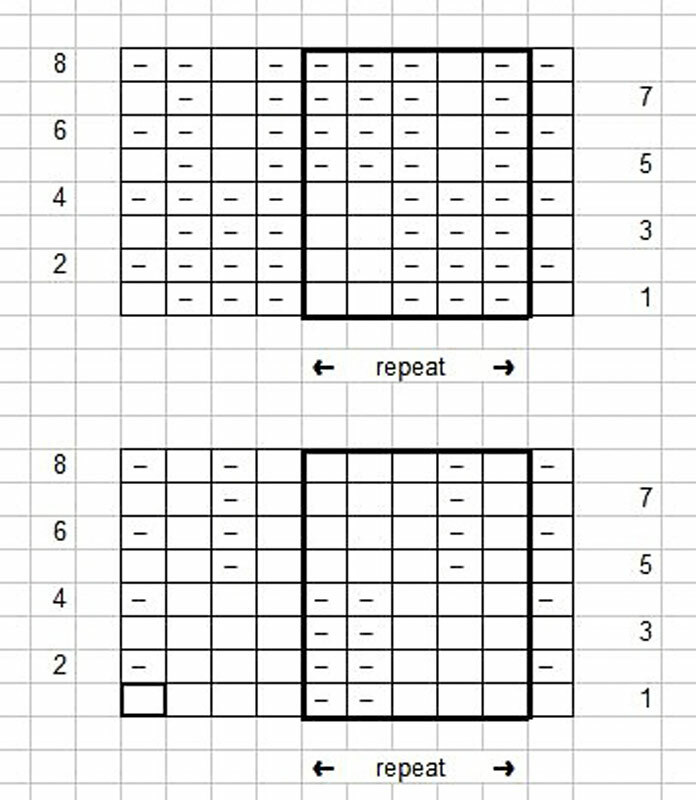 Repeat these 8 rows 3 times, and then rows 1-4. Break Col A, join Col B.
Knit next row, then work pattern rows 6, 7, and 8. Work 4 more repeats (rows 1-8). Break Col B and re-join Col A.
Knit next row (counts as Row 1). Work 3 repeats (rows 1-8), then work rows 1-4. Knit 3 rows, then, with WS facing, cast off all sts. 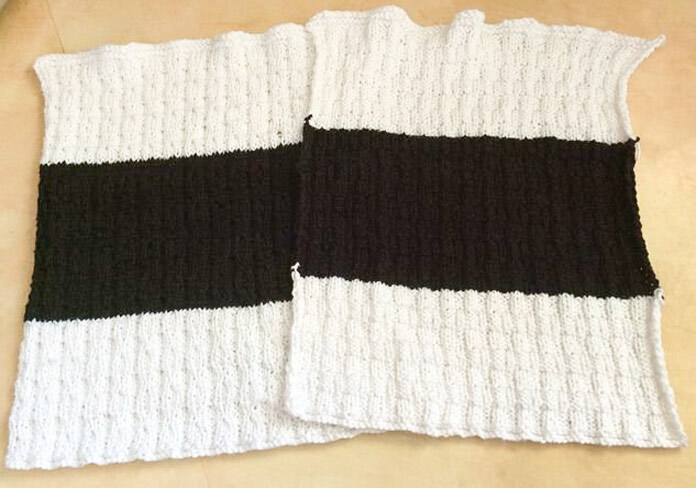 Two lovely pieces knit in Radiant Cotton, ready to transform into a pillow cover. Note the smooth color transitions. I’ve decided that you deserve a bonus. Come back tomorrow for a bonus post where I’ll join our two pieces of Fibra Natura Radiant Cotton-knit into our pillow cover, complete with a zipper! This is part 5 of 6 in this series. Go back to part 4: Chart or text your way to a radiant knitted dishcloth!